Now with SMS messaging from 4c per message. 95 - 98% of text messages are read within seconds of receipt. Our Web and Mobile console allows you to get in contact with one or one million recipients. Track delivery for every message sent from 5c SMS to your recipient's mobile. 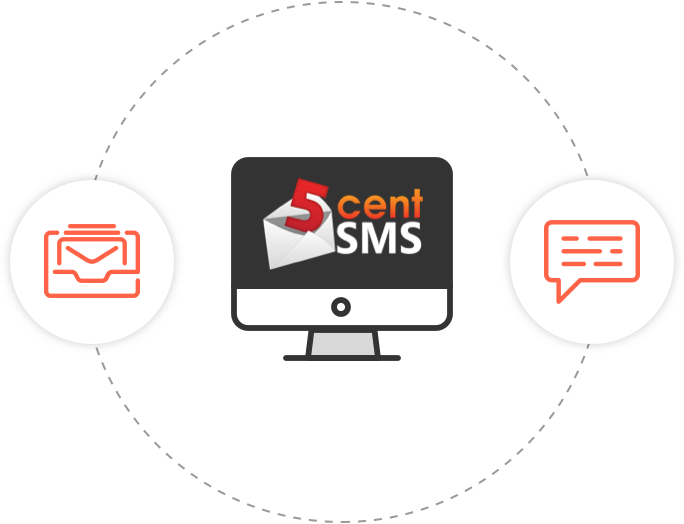 Integrate 5c SMS into your applications to send and receive messages directly from your software. Our Bulk Messaging Dashboard makes it easy to send one, or one million messages. Just follow the prompts to upload a list of recipients, select how your reciepients will reply to you, set a Sender ID, write your message text, then schedule when you messages should be sent. Send SMS message from any email client. Email to SMS enables you to simply send messages to a special email address. We'll convert the email automatically into an SMS message. You'll even receive replies back to your email address. A dedicated virtual number means you can send and receive messages from your own virtual mobile number. You can publish and advertise this number and you will receive any messages or replies send to it by Email, Web, Webhook or API. *Pricing is per SMS message segment (up to 160 characters) and excludes GST. You can create an account from the "Create an Account" link at the top of the page. Once you have logged in select the "Buy Messages" button, select your preferred payment option and follow the prompts. The 5c SMS platform is built using the latest and best scalability, resiliency and security practices. We guarentee uptime for our service and API for all business plan customers. Unlike other SMS Providers, we do not route SMS traffic via overseas or mixed route providers. All 5c SMS messages are sent through direct connections to Australian mobile carriers. You can configure 5c SMS to email you when your balance is running low. You can also configure an Auto-Recharge to make sure you never run out of messages. Our support engineers are always available to get you in touch with your contacts. If your mission critical services need immediate support we also offer 24/7 personalised support with guarenteed response times. Manage and report on multiple users from a single account using sub-accounts which are centrally billed. Security is our top priority, all your accounts and data are protected. If you would like to discuss how this incredibly effective communication medium can be used, or have questions regarding our service or your account, please contact us.